Details of the life of Herleva are few and far between. The chroniclers are contradictory and leave out important information. Even her name could be spelled in many different ways. We have Arletta, Arlette, Arlotta, Arlotte, Erleve, Harlena, Harlette, Herlette, Herleva, Herleve, and Herlotte. To keep it simple she will be called Herleva. The best guess is Herleva was born c. 1003-1010 in Falaise, Normandy in France. Later chroniclers have her father named as Fulbert and it’s been said he was a tanner. Falaise was well known at that time for its industry of tanning or converting animal skin or hide into leather. Recent historians have examined the chronicles and Fulbert is called a “polinctores”. This term in classical Latin means a person who prepares bodies for burial. This could further be interpreted as an embalmer or undertaker. Robert had become Duke of Normandy in 1027 so they must have met during this time and Herleva became his mistress. We don’t know the exact date of William’s birth but some historians guess from the chronicle evidence that he was born sometime between September of 1028 and September of 1029. William may have spent his early years in the home of his mother. We know William had a sister named Adelaide who married three men. She might have been born by another mistress of Robert’s but she most likely is William’s full sister. Adelaide was married to Enguerrand, count of Pontieu, Lambert of Lens and Odo, count of Champagne. Sometime after the birth of William, Herleva’s father Fulbert appears to have become a chamberlain to Duke Robert. Herleva had two brothers, Walter and Osbern. Their names appear in charters from this time so they must have benefited from their sister’s relationship to Robert. Walter emerges as a guardian to the young Duke William during the perilous years after his father died. Walter is said to have saved William’s life at one point by grabbing William from his bed and carrying him to safety in the home of some poor people, avoiding assassination. Walter had at least two daughters named Clara and Matilda. Clara became a nun at Montivilliers and Matilda married Ralph Tesson. Tesson came from a substantial medieval Norman family. At one point after the birth of William, Robert married Herleva off to Herluin, Vicomte of Conteville. She was to have three children with Herluin. Odo was probably born c. 1030. He would become Bishop of Bayeux either when he was fourteen or nineteen. He is best known as a warrior and statesman and accompanied William to England. He was at the Battle of Hastings in 1066 either fighting or urging on the troops in his capacity as a churchman. He may have commissioned the Bayeux Tapestry to hang in the Cathedral there. In 1067, Odo was made Earl of Kent and became the largest landholder in England barring the King himself. Odo was to get into trouble by inspiring rebellion against William and later backed William’s wayward son Robert Curthose. At one point Odo was imprisoned. William was persuaded to release Odo on his deathbed. He continued to stir up trouble until he joined the First Crusade and died on the way at Palermo in early 1097. Herleva’s other son by Herluin was Robert, count of Mortain, born c. 1031. 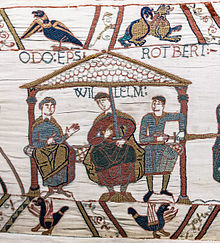 Robert was to be one of the Conqueror’s biggest supporters, participating in the invasion of England, providing ships and fighting at Hastings. William gave him large landholdings in England. He mostly lived in Normandy until he died in 1090. Herleva also had at least one daughter with Herluin who remains unnamed but the records show she married William, lord of the La Ferté-Macé. It is known that Herluin married another woman named Fredesendis. Herluin founded a monastery at Grestain c. 1050 and his second wife’s name appears in the list of benefactors. We can therefore deduce that Herleva died c. 1050. Her legacy lived on in her sons who helped change the course of English and French history. She was an extraordinary woman. Does anybody on here know if William’s sister Adealide had a son by the name of Peirs de Valognes, son of Enguerrand II? He founded Binham Priory in England. Piers was Williams nephew and on my family tree but I cannot find any real evidence of this. The Binham Priory article from Wikipedia briefly calls Peter a nephew of William’s and cites a web-page from The Norfolk Archaeological Trust, but that page does not describe Peter’s ancestry. which cites a discussion on GEN-MEDIEVAL-L in 2004 that I have not yet read so I don’t know whether to give it credence. What we do know is that the Conqueror’s sister Adelaide married three times. Firstly, to Enguerrand II, Count of Ponthieu. The Council of Reims in 1049 declared this marriage prohibited on grounds of “consanguinity”. However, Adelaide had already borne a daughter, Adelaide II, who married William de Breteuil, son of William FitzOsbern, 1st Earl of Hereford. Enguerrand died in 1053 and was succeeded by his brother Guy I, who captured Harold Godwinson (see the Bayeux tapestry). She secondly married Lambert II, Count of Lens, younger son of Eustace I, Count of Boulogne. Lambert was killed in 1054 at Lille, aiding Baldwin V, Count of Flanders against (“Holy Roman”) Emperor Henry III. Their daughter was Judith of Lens, who married (but betrayed) Waltheof, Earl of Huntingdon and Northumbria. In 1060 Adelaide thirdly married Odo, Count of Champagne. They had a son, Stephen, Count of Aumale. Circa 1079, Peter of Valognes married Albreda, a daughter of Hubert de Rye and thus a sister of Eudo the Dapifer (Sire de Preaux by 1070). Peter and Albreda had children named Robert, Roger and Muriel. Hubert de Rye “is legendarily known as the loyal vassal who hosted Duke William of Normandy prior to his flight from Valognes during a revolt [in] 1047.” Hubert apparently had six sons: Robert (Bishop of Seez), Hubert, William (lord of Bardley in Hertfordshire), Eudo, Adam (a Domesday Commissioner who held lands under Odo of Bayeux), and Ralph (Castellan of Nottingham), and at least two daughters: Albreda and Muriel (married to an Osbert). Eudo’s wed Rohais, daughter of Richard FitzGlbert circa 1088; they had one daughter, Margaret, who married William de Mandeville, Constable of the Tower of London until he was removed because of Ranulf de Flambard’s escape in 1101; Eudo was then appointed in his stead. Eudo was steward to William I, William II and Henry I. He was “involved” in the building of Colchester Castle and was appointed its custodian until his death in 1120 at Preaux in Normandy. His body was transferred to England and was buried at Colchester on 28 February 1120. Colchester Town Hall has a statue of him. A monastic charter of Count Eudon of Brittany, younger double-cousin to William’s father Duke Robert I, dated circa 1050, was witnessed by “Viscount Robert and his brother Odo”. In addition to implying that Robert was the elder brother, it suggests an origin for Herluin’s family. For, in the early 900s, when Landevennec Abbey in far western Brittany was destroyed by the Loire Vikings, its monks fled far, to Montreuil the capital of Ponthieu, where they were given shelter by Count Haelchod and built an abbey to their patron saint Winwaloe (Guenole). After Haelchod, his son Count Herluin (“Herleuuin”) sponsored the monks, who returned to Landevennec to rebuild on the site of the former wooden abbey, but in stone. To my eyes and ears, Haelchod and Herluin seem Brythonic names, perhaps descendants of some of the British troops stationed on the coasts of Gaul by Magnus Maximus in 383 as part of his plan to overthrow Gratian. Conteville, it transpires, is a cult site of saint Samson of Dol in Brittany. An interesting choice of Viscounty that again suggests that the younger Herluin, husband of Herleva, had significant connections with the Bretons. That Robert as Count of Mortain had many Breton tenants in England, a persistent interest in Brittany, and gave a daughter in marriage to a Breton lord, tends to support this idea. It’s been claimed by an historian that Bishop Odo served on the west (Breton, Angevin, Poitevin and Maine) wing of William’s army in the Battle of Hastings. It’s conceivable that Robert and Odo/Eudo may have been named in honour of Duke Robert of Normandy and Count Eudon. However, there’s a closer parallel with Count Odo of Paris and his brother Robert I of France, mighty defenders against the Vikings though they were. Not only a daughter, up to three daughters of the Count of Mortain married with different barons, Agnes with Andre I of Vitré, Denise with Guy II of Laval and Emma with William IV Earl of Tolosa, great-grandfather of Leonor of Aquitaine. William The Conqueror is one of my ever-so great Grandfathers on my father’s side of our family. My older sister does genealogy for the Mormon Church and she was able to trace our family back through William to his ancestors who were Merovingians. The Merovingians were called “sorcerer kings” or “thaumaturge kings” and sometimes called the “long haired Kings. I thank you for all the work to put this site together. Some of William I’s ancestors were Merovingians; closer to his time were Carolingians. Mind, these descents were principally through his numerous Breton ancestors. Bretons/Britons (the French language makes no distinction) appear to have been all over northern France in the early middle ages: the Counts of Maine and Ponthieu, as well as the noble French house of Montmorency all seem to have been British in origin; their early heads had such names as Harvey and Haelchod. DNA analysis of the remains of William’s ancestors Richard I and Richard II of Normandy is underway; the work is due for completion around October 2016. Preliminary results indicate that they were R1b (the dominant Y chromosomal haplogroup of westernmost Europe), perhaps R1b-L21, that is Atlantic Celtic. Always liked Herleva and her family. Odo may have constantly caused trouble for his brother, but the rest of Herleva’s male relatives seemed to have been far more protective of William than his relatives on his father’s side…. Herleva’s brother Walter certainly saved William’s young life. It’s true that his legitimate Norman relatives all thought they should be Duke of Normandy. Interestingly, his father’s double-cousin Duke Alan III of Brittany, who had a fairly claim to Normandy, defended William’s right with his life, as did three other of his guardians. William’s most loyal ally was Count Alan Rufus, son of Count Eudon, younger brother of Alan III. Domesday’s records, combined with accounts of the battle, suggest that Count Alan intervened to protect William from an assault led by Earl Gyrth. Alan’s title does not appear to be territorial, despite diverse later claims by monastic charters. Rather, it may be from the Latin term for “royal thegn”, as under his father’s cousin King Edward the Confessor, Alan held Wyken Farm in the parish of Bury St Edmunds in Suffolk; Alan was outstandingly generous to the English, and it was at Bury that he was, well, buried, by Abbot Baldwin, the royal physician. It’s often forgotten that iconic figures like William the Conqueror had a mother and sisters. I’ve always thought it would be fascinating to go back and actually talk to these women, find out some of their feelings, hopes and fears. Really interesting – thank you! You’re welcome Jo! I share your curiosity about these women and would love to speak to them. This information is very educative !! Thank you. I love background to history like this. You’re welcome Glyn and thanks for reading! I’m fascinated by Norman history, Susan. So thanks for another interesting post which sheds light on William’s humble beginnings. Herleva must have been a resourceful and resilient woman to rise from the role of mistress to mother of the king of England, though her part in this is not recorded. Her children influenced the course of history. William went on to have a successful marriage with Mathilda of Flanders and trusted her to rule Normandy while he was away in England. In Caen, the abbey which was built for Mathilda bears witness to his devotion. I think this is Herleva’s legacy! Yes DIASPORA52! You are so right. William was singularly faithful to Matilda too. Very unusual for a nobleman of the time. Thanks for reading! Caen castle inspired Alan Rufus’s Richmond castle in Yorkshire, though the latter has a defensive improvement for the benefit of archers, and aspects modelled on the architecture of abbeys. Alan was quite the innovator.